XIMEA always strives to offer to customers something extra on top of everything else. We call it - To go the extra Vision. This is why cooperation with the company called Fastvideo was so important for us. You can explore the new possibilities below. 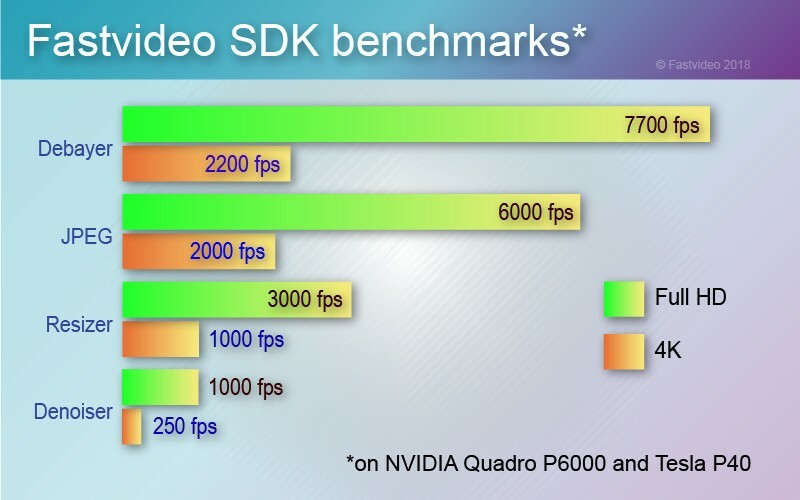 Fastvideo company has designed high performance SDK to offer full image processing pipeline on GPU for camera applications with total peak performance 4 GPix/s. For example, JPEG encoding for 24-bit image with resolution 4K could be done at 0.8 ms on NVIDIA GeForce GTX 1080 GPU. 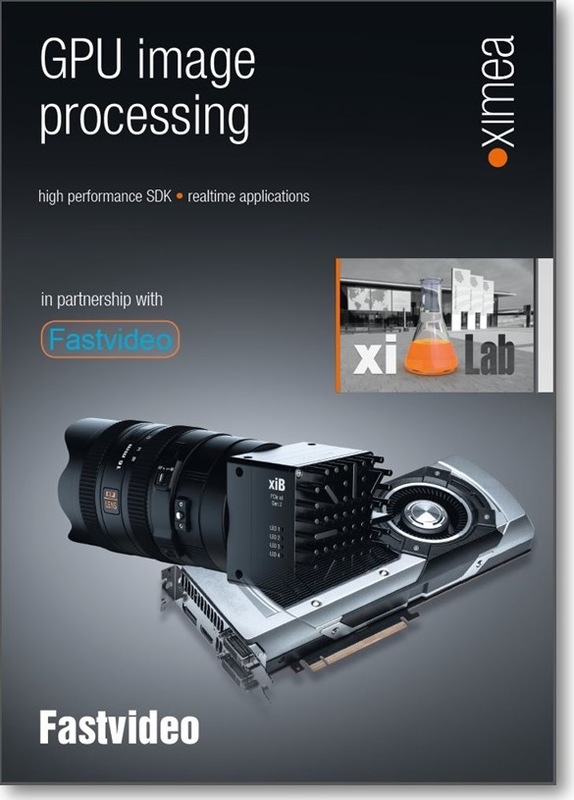 This SDK corresponds to standard image and video processing pipeline for camera applications. It covers all image processing stages starting from raw image acquisition from a camera to JPEG or JPEG2000 compression with storage to RAM or SSD/HDD. Currently, Fastvideo offers the fastest on the market solutions for demosaicing, denoising, resizing, JPEG and JPEG2000 encoding on GPU. Fast compression and realtime image and video processing on GPU is popular and growing in demand in modern industries. Indeed, high framerate cameras, real-time video surveillance systems, 3D, VR and digital cinema solutions, heavy-loaded web services and medical equipment, often require zero tolerance to delays due to image processing. And this is where the performance of image and video processing could be a serious bottleneck. Comparing with conventional solutions on CPU, GPU-based algorithm implementations from Fastvideo SDK demonstrate 10-30 times performance speed up retaining the same or even better quality of the output and minimizing the host processor workload. Wide range offering of integration services to connect your software with Fastvideo Image & Video Processing SDK. To achieve high performance on GPU for specific imaging applications Fastvideo is also developing custom SDKs according to agreed specification. You can also have a look at our projects in development. Anything displayed with the reference „xiLab“ or in our xiLab space in our booth refers therefore to technologies and prototypes that are developed and functional, but where XIMEA does not commit on release, timelines or final appearance. We are keen to learn the markets' reaction to items displayed or exposed under this label. Fastvideo team consists of experienced and highly dedicated professionals focused on image processing using GPU parallel computations. Our technologies show unmatched performance in image compression and decompression, demosaicing, encoding and decoding of video streams in high speed imaging.